California Three Day Notice Of Breach of Lease Served By A Registered Process Server- Is the Proof Of Service Enough, Or Does The Server Have To Appear In Court To Testify in The Unlawful Detainer? When a lessee or tenant fails to pay rent, California Code of Civil Procedure section 1161 requires that the landlord must provide the tenant with a three-day notice to pay rent or quit before bring an unlawful detainer. Commercial leases sometime provide for a different number of days, but the “pay rent or quit” notice is routinely served. 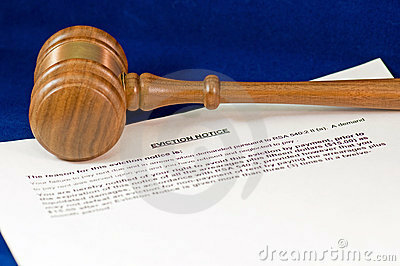 If the tenant does not pay by the end of the final day, the landlord may immediately file an unlawful detainer. The three day notice does not have to served by a registered process server. These process servers are registered with the county clerk / recorder under Business & Professions section 22350. As of 2005, on registration process servers are required to be fingerprinted so that the county can run a background check. A recent California unlawful detainer decision concerned a lease in Beverly Hills. The notice was served by a registered process server. The lessees, in their verified answer, denied they were served with the notice. At trial, the process server did not appear. The Lessor attempted to introduce into evidence the proof of service, but the trial court refused to allow it, ruling that it was hearsay. Apparently the lessees did not testify that they did not receive the notice; they relied on the lack of proof that it had been served at all. The trial court was overruled, because it overlooked Evidence Code section 647. This provides that the return of a registered process server establishes a presumption of the facts stated in the return. This means that, once the document is admitted, the burden is on the lessee or tenant to present evidence that the notice was not served. If the lessee provides credible evidence, then it may be necessary for the process server to testify. Experienced real estate attorneys always recommend that three day notices be served by someone who will be able to appear in court and testify as to the service. If the tenant is especially troubling, they should have witnesses, or use a registered process server. For the lessee, if there truly was no valid service, they should include this in their answer and testify so; this puts the burden back on the lessor to present evidence otherwise.